Mehrunnisa was born in 1577 CE in Kandahar. She was the daughter of a Persian fortune-seeker – Mirza Ghias Beg. He offered his services at Akbar’s court as an army commander and soon became the most powerful army chief and minister in the reign of Jahangir. He was given the title of Itimad-ud-Daulah (Pillar of the State). His daughter was first given the title of Noor Mahal and then Noor Jahan (Light of the World), when she married Emperor Jahangir. 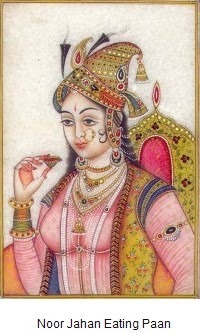 It is said that Noor Jahan was responsible for Shah Jahan’s ascendancy to the Mughal throne. Noor Jahan-the wife of Emperor Jahangir, was certainly ‘destiny’s chosen child’ and wielded extraordinary power from inside the harem as Jahangir’s favorite queen. In his last years, Noor Jahan became the virtual ruler of the empire! Her family, too, remained extremely powerful for more than 70 years of the Mughal era when her niece Arjumand Banu Begum (Mumtaz Mahal) married Shah Jahan (Khurram) and became his beloved queen. Shah Jahan (Khurram) is said to have built the world’s most beautiful monument of love – The Taj Mahal ? The Mughal Period is said to be one of the most fascinating eras of India’s history in view of the many-splendored rule of some of India’s greatest emperors. Whilst Akbar’s reign is counted among the four Grand Monarchies of the World by eminent historians, Jahangir’s reign is known for the power the Mughal ruler wielded over a vast empire. While Akbar built the empire and created a united India, Jahangir became known as the emperor who promoted all variety of art – painting, singing and gardening. 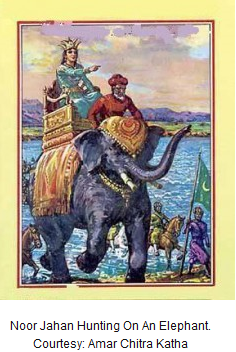 His love story with Noor Jahan, the widowed daughter of his chief army commander and minister Mirza Ghias Beg, is considered second only to that of the more famous Mumtaz Mahal and Emperor Shah Jahan. Hence, of course, Noor Jahan was instrumental in bringing her niece Mumtaz Mahal (Arjumand Banu Begum) to Jahangir’s court and later to bring about her marriage with Shah Jahan (Prince Khurram). 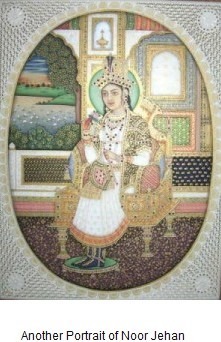 The coming of Noor Jahan into the court of Jahangir was one of the two most important developments of his early years. The second event was the rise of Khurram, Jahangir’s third son and favorite of his father. Noor Jahan, daughter of Jahangir’s army chief, was earlier married to Ali Quli Istajlu the title of Sher Afghan. Was conferred to him by Jahangir for killing a tiger single handedly. 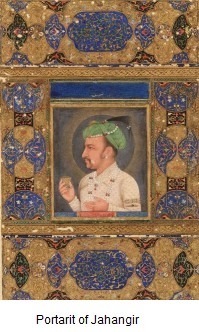 Sher Afghan Quli Khan, who was posted to Bengal by Jahangir. Sher Afghan Quli Khan died in Bengal in 1607 and Meherunnisa returned to Agra to her father as a widow of 30. The annual Meena Bazaar held by the royal women and wives of nobles at the Mughal court was an event initiated by Humayun and was meant to offer an opportunity for women to not only buy jewels and clothes but also to flirt in a controlled environment and have a good time. Jahangir famously first met the beautiful Meherunnisa in 1611 at the annual Meena Bazaar, four years after she came to Agra as a widow. Jahangir, say historical records, fell madly in love with her because of her exquisite beauty and mastery over several arts. They were married within months and Meherunnisa was first given the title of Noor Mahal and then Noor Jahan (Light of the World). 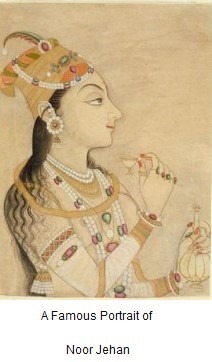 Noor Jahan was the twentieth wife of the Jahangir, but she was said to be different from all Mughal women. She was an accomplished poetess, a garment and jewelry designer, a perfume maker, a connoisseur of carpets and art objects. She was surprisingly also known as a skilled huntress of great prowess. Records say that she could shoot tigers from a closed howdah on top of an elephant and once killed four tigers at one go. It is said because of her scintillating beauty, she became the most prolific subject of portraits through the following century, though how the painters got access to her in the harem is still is not known! An answer to this question is a life-size portrait of Nur-uddin Jahangir, who was so fond of luxury and opulence that he visualized his own power to be completely ‘global’. 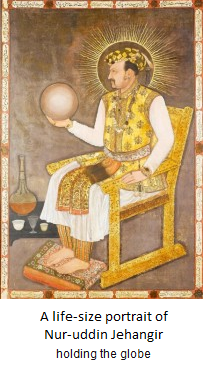 While he camped in Mandu in Madhya Pradesh in 1617, his favorite artist Abul Hasan worked for months to complete his most well-known portrait in which he held the golden globe of the earth and sat on a Portuguese style throne with wine glasses from China and Italy surrounding him. His head had a halo like the sun, to signify that he was Allah’s representative on earth. 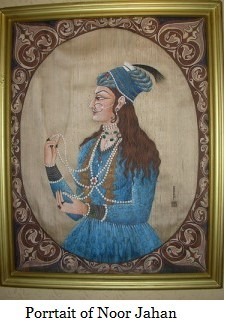 This portrait – painted on fine cotton canvas – was auctioned recently (April 2011) in Britain Rs.10 crore! The legend that surrounds this portrait also says that Abul Hasan was such a close confidante and favorite courtier of Emperor Jahangir that he was possibly allowed to paint portraits of Noor Jahan. 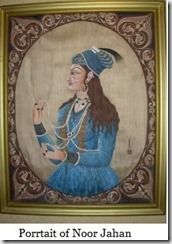 Thus, while the emperor was camping in Mandu, Hasan also painted a portrait of Noor Jahan as a hunter! With her father as the emperor’s powerful chief minister, Noor Jahan’s new status also increased. Her brother Asaf Khan too rose to high rank at the court. Hence the Itmad-ud-Daula family thus became an integral part of the royal court with access to all areas of the palace including the harem. They acquired unimaginable wealth and lived in a lavish lifestyle. When Noor Jahan arranged the marriage of her niece Arjumand Banu Begum (Mumtaz Mahal) with Prince Khurram (Shah Jahan) the bond between the two families became even stronger. History says that the quartet – Mirza Ghias Beg, Noor Jehan, Asaf Khan and Prince Khurram – wielded so much power at Jahangir’s court that they almost ran the empire on their own terms. Noor Jahan, for instance, built the grand mausoleum for her father in Agra, very close to the Taj Mahal. Her marriage to Jahangir gave her unrestricted access to his wealth and knowledge. But Jahangir was unfortunately addicted to alcohol and opium. Both his brothers Daniyal and Murad had died of these vices. The effects of Jahangir’s vices began to catch up with his health. And naturally, Noor Jahan became ‘the power behind the throne’ with her personality and expertise in court intrigues. As Jahangir battled his addictions, Noor Jahan became one of the most powerful women to ever rule India with an iron hand. She ran the affairs of the state from the harem and every decision about the empire had to be taken only with her consent. The result of her unlimited power was that her immediate family members were given valuable endowments and positions. She had successfully married her own daughter from her first marriage to Quli Khan – Ladli Begum – to Prince Shahriyar, the fourth son of Jahangir by a royal concubine. Through Jahangir’s reign, as the favorite queen of the emperor, Noor Jahan already wielded a great deal of real power in affairs of state. The Mughal Empire bestowed absolute power upon the emperor. Thus, his close confidantes, who could influence him, also became extremely powerful. Noor Jahan held absolute power. Jahangir’s addiction to opium and alcohol made it easier for her to widen her influence greatly. For several years – especially the last years of Jahangir– she held complete imperial power and was recognized as the real force behind the Mughal throne. She even gave audiences in her palace and the ministers consulted with her on most matters of state and finance. Indeed, Jahangir even permitted coinage to be struck in her name, confirming her sovereignty. In 1626, Jahangir was captured by rebels while he was travelling to Kashmir. Noor Jahan – through her negotiating skills – got her husband released and Jahangir had a temporary respite from his troubles. Jahangir was trying to restore his health by visiting Kashmir and Kabul. He went from Kabul to Kashmir but returned to Lahore on account of a severe cold. Jahangir died on the way back from Kashmir near Sarai Saadabad on October 28, 1627. 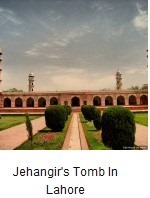 To preserve his body, the entrails were removed and buried in the Baghsar Fort, Kashmir. The body was then transferred to Lahore to be buried in Shahdara Bagh, a suburb of Lahore, Punjab. 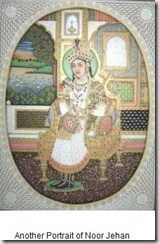 He was succeeded by his third son, Prince Khurram who took the title of Shah Jahan. Jahangir’s elegant mausoleum is located in the Shahdara locale of Lahore and is a popular tourist attraction in Lahore. After Jahangir’s death, Noor Jahan devoted her life to rebuild her power at the court but was sent by Shah Jahan to retire in a comfortable mansion where she lived till her death. She devoted her last years to building some of best Mughal tombs and to the making of perfumes from roses, an art she had learnt from her mother-Asmat Begam . She supervised the building of her father’s tomb in Agra, just a few kilometers from the Taj Mahal. When Jahangir died in 1627, he was buried in Shahadara Bagh in Lahore and this imposing tomb too, bears the imprint of Noor Jahan’s talent and style. The tomb has beautiful gardens and wooded walks around, which were personally designed and laid out by Noor Jahan herself. 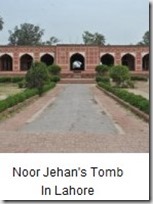 Noor Jahan died in 1645 at the age of 68, and was also buried in Shahadara Bagh in Lahore, now in Pakistan. As one of strongest women of the Mughal era, she built her own tomb near that of her husband Jahangir, because of whom, she held unparalleled power throughout her life. This entry was posted in Historical Accounts and tagged Ali Quli Istajlu, Asaf Khan, Asmat Begam, Itmad-ud-Daula, Jahangir, Khurram, Meherunnisa, Noor Jahan, Sher Afghan. Bookmark the permalink.